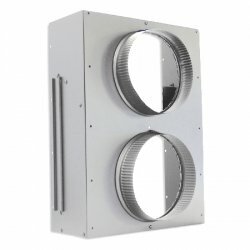 Cellar Pro Rear Duct Kit with Fan | CellarPro Mid Size Ref. This duct kit that includes an 8-inch inline fan (240CFM), which increases the ducting distance from 100 to 200 equivalent feet. The inline fan also can be used with short-distance ducting to allow the cooling unit's variable-speed fans to be set at lower (and therefore quieter) settings. The ducting itself is not included with the kit. Please purchase locally at home supply store.